Want more information? Check out Telling Stories to read about real experiences with genetics from patients, family members, caregivers, and professionals. Want to share your story? Visit DNAandU. We can't change our genes, but we can change our behavior! Take steps to prevent disease, lower risk, and find problems early when treatments work best. Learn more ways you can live healthier from the American Heart Association. 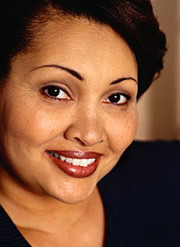 Several of my aunts died of breast cancer, so I was very worried when I was diagnosed with breast cancer at age 42. When I talked about my family health history with my doctor, he was also concerned and referred me to a geneticist. At the appointment, I learned that some people inherit a gene that increases their risk for developing breast cancer younger. I decided to undergo testing for the gene. When I tested positive, I was surprised. Knowing that I have this gene was powerful information. I was able to make important health decisions, like prophylactic mastectomy (preventive surgery to remove the breasts) and oophorectomy (surgery to remove the ovaries) to lower my risk of getting cancer again. Do you have the same eye and hair color as many of your family members? The same thing can happen with diseases—they can be passed down from one family member to another. The way this happens is through genes, the genetic information that you get directly from your parents. In most cases, diseases or other problems do not have one single cause. They come from a combination of your genes, your choices, and your environment. How Do Genes Cause Problems? Most genes we get from our parents are copies that work the same way they do in our parents. But sometimes, a gene is not a perfect copy. Changes in genes are called mutations, and everyone has some. Some mutations work better than the original, and many make no difference at all. Some mutations cause problems. A condition that is caused by mutations in one or more genes is called a genetic disorder. There is a group of rare diseases caused by mutations in one gene at a time. These are called single-gene disorders. But most common diseases are caused by a combination of gene changes, lifestyle choices, and your environment. Mutations can be inherited from a parent to a child (“hereditary”) or they can happen during a person’s lifetime (“acquired”). Acquired mutations can be caused by environmental factors such as ultraviolet radiation from the sun. The acquired mutations you develop during your lifetime are in cells called somatic cells—the cells that make up most of your body. They may cause problems for you, such as skin cancer, but you cannot pass them to your children. Why Do Mutations Cause Disease? Proteins do the work that builds the parts of your body and keeps it moving. When the genes that instruct the making of proteins have mutations and do not work properly, whole systems in the body can have problems. These upsets can be caused in a number of ways. A new copy of your genes is made in every new cell that your body creates throughout your life. If those copies have mistakes, this can cause problems. For example, some gene changes can make you more likely to get cancer. Your environment can also directly cause changes to DNA inside your cells. For example, the sun damages DNA in the cells that are exposed to it, and if the damage goes unrepaired, these gene changes will be copied as your body creates new cells. You might read about “a gene for” a condition. This is not quite right. When we describe genes that cause disease, we are really talking about a gene that has a genetic mutation. The gene should help create a normal, healthy state, but a mutation of that gene can cause problems. For example, everyone has a gene called CFTR, but only people with a mutation in the CFTR gene have cystic fibrosis, a genetic disease. The cell’s system for making copies of genes is very good because it safeguards against many of the mistakes that are bound to happen as your body makes billions of new cells throughout your life. Even when your genes are not copied perfectly, they will usually still function correctly, or at least well enough that you will not notice a problem. Only a small number of mutations cause a genetic disorder. Sometimes, your body can repair the gene to help protect itself from disease. Mutations can sometimes even have a positive effect, such as resistance against disease, although this is rare. What Other Types of Mutations Are There? We have already seen that some genes can be copied incorrectly—that is one form of mutation. We can also have different numbers of genes. In general, we all have two copies of each gene. We get one from each parent. In some cases, people are born with one, three, or more copies of a particular gene. It is also possible for the gene to be entirely missing. This type of genetic difference is called a copy number variation (CNV). It’s easy to see how a missing gene could cause a problem, but extra copies can, too. Think of it like having too many people in a small space, trying to do the same job. Genes are stored in chromosomes, big groups of genes that sit in the middle of almost all your body’s cells. Humans have 23 pairs of chromosomes, for a total of 46. Some people have an extra copy of a chromosome, or are missing one. Sometimes a chromosome gets broken, and an extra piece can end up in one cell (and be missing from another cell). This is similar to having an extra or missing copy of a gene, but it happens with big groups of genes. This type of change can cause problems with growth, development, and function of your body systems. Many conditions and diseases are related to genes in some way. Some mutations may be in a single gene, although most disorders are more complex. Many diseases, such as heart disease and diabetes, are caused by issues with multiple genes in combination with lifestyle and environmental factors.